A three-year-old American boy has shot his mother and father with the same bullet after pulling a gun from her handbag, police say. 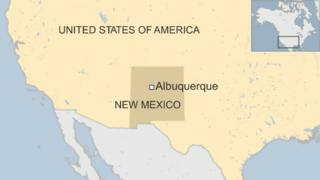 The incident took place in a motel room on Saturday afternoon in Albuquerque in the state of New Mexico. The toddler was apparently reaching for an iPod. The bullet passed through his father's buttock and hit his mother, who is eight months pregnant, in the arm. Both parents are said to be recovering. The boy's two-year-old sister, who was also in the room at the America's Best Value Inn, was unhurt. Justin Reynolds told NBC News station KOB he and his girlfriend Monique Villescas were about to order a pizza when he heard the shot. "The next minute I realised my girlfriend was bleeding. Then I sat down and realised I was shot too." He called emergency services and tried to staunch Ms Villescas's bleeding with towels. He said: "I was more worried about my girlfriend than myself and anything else that was going on. And my son because I didn't know if he had shot himself or not. He was shocked and crying. It was traumatising." Mr Reynolds has been released from hospital and Ms Villescas is in a stable condition. Albuquerque police said the district attorney's office would decide whether the parents would face negligence charges. The children have been taken into care. In December a woman in the state of Idaho was killed after her two-year-old son accidentally shot her with a gun he found when reaching into her handbag in a Wal-Mart store.